*** To meet Rex, please email us to arrange a convenient time as he will not be at our adoptions. 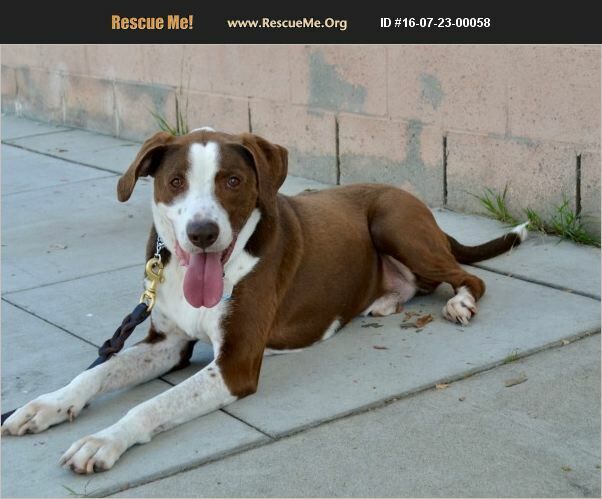 NO DOGS and CATS in the home*** Rex was born approx July 2013 and is 57 lbs. He is currently being trained with a trainer at a boarding facility. He likes to be with you and is very good with people. He is an active boy and would love to go for runs and hikes with his new owner. Ideally, he would love an active family. He has a high prey instinct so needs a home with NO Dogs and NO cats! Unfortunately, as a result of no dogs and no cats and with all our fosters having other animals, he is living in a boarding facility. We would love for him to be in a furever home and not in the boarding facility. *** NO DOGS AND CATS in the home *** Stop by and meet our pets on SATURDAYS or if you are not able, email to arrange a convenient time to meet the pet. Adoption events are Saturday from 11 am to 3 pm at R and R Pet Lifestyle and Supply at 2780 Tapo Canyon Road, Simi Valley (SE corner of Tapo Canyon and Alamo), except holiday weekends. Please email (staff@arvsimi.org) ahead to make sure a particular pet will be at adoptions.